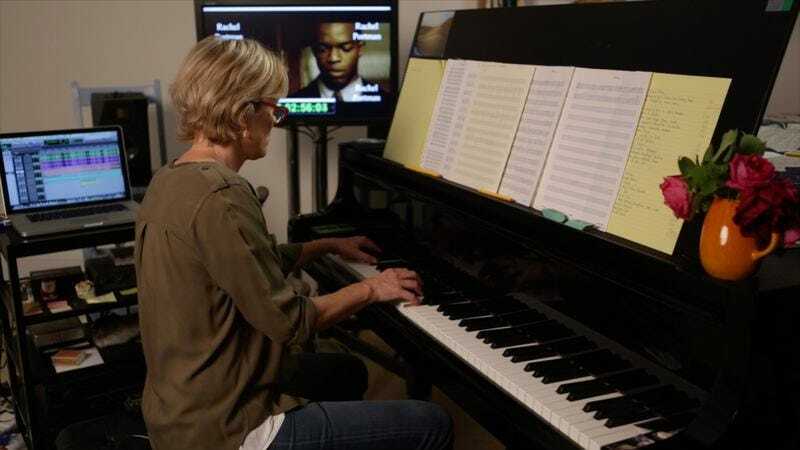 The role of film composer is a crucial yet relatively uncelebrated one—this despite a movie’s score often doing 90 percent of the emotional lifting. (For proof of its importance, look no further than all those popular “melodica” covers on YouTube.) As gushingly expressed by director James Cameron near the beginning of Score: A Film Music Documentary, it’s “the heart and soul of the film,” absolutely essential to a movie’s success, and a subject deserving of a spotlight bigger than an annual Academy Awards montage. And so first-time director Matt Schrader aims to rescue this often overlooked world of film music from the background, primarily by yakking over it. Part history lesson, part educational film, part time-killer for tourists at Universal Studios (right down to the requisite filler blather from Leonard Maltin), Score is a loving tribute that approaches its subject with a hooray-for-Hollywood reverence that people who’ve never heard of John Williams may find illuminating, but will likely disappoint even casual fans of the form. To his credit, Schrader has excellent taste. The many, many talking heads here offer a diverse array of composers like Hans Zimmer, Bear McCreary, Tom Holkenborg (a.k.a. Junkie XL), Mark Mothersbaugh, Rachel Portman, Quincy Jones, Alexandre Desplat, and Christophe Beck, plus a dozen more. Each of them, somewhat redundantly, takes turns offering testimony to the importance and unique challenges of their work. Within these interviews, we do get the occasional glimmer of insight. McCreary discusses the psychology of scoring as a means of ferreting out a filmmaker’s “insecurities,” supported by Cameron’s characterization of the composer as therapist, tasked with inferring the emotions a director is subconsciously trying to express. The flamboyant Zimmer very German-ly conveys the perpetual angst of never knowing where the music will come from next—or if it will at all. Hearing these industry giants fret over having to create an entirely separate artistic work after a film has been completed, their names already ominously hanging over them on subway posters and billboards along Sunset Boulevard, fosters some new appreciation for the incredible pressures they operate under, which only makes their successes more astounding. Had Score narrowed its focus and delved more deeply into that process, it might feel more substantive. Unfortunately, it aims to be as comprehensive as possible about a subject as old as cinema itself, and as a result ends up feeling both breezy and overlong. Too much of the film is spent paying glancing tribute to acknowledged masters and their contributions to the form—Max Steiner’s standard-setting work on King Kong; Alex North’s standard-upending score for A Streetcar Named Desire; Bernard Herrmann’s embrace of mystery and discordance in his collaborations with Alfred Hitchcock, etc. But aside from some overdue recognition for the brilliance of Jerry Goldsmith, there’s not much here in the way of revelation. Similarly, while it’s always a thrill to watch archival footage of John Williams working out the scores for Jaws, E.T, Star Wars, etc. on his piano, a young Steven Spielberg over his shoulder, there’s nothing here you couldn’t find on myriad DVD extras, if you’re so inclined. 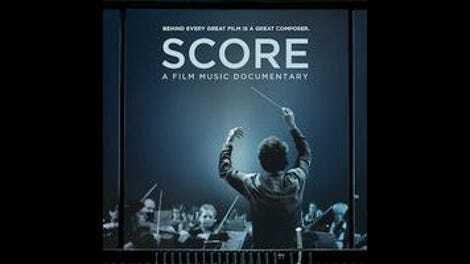 Score does make a compelling argument for the unsung greatness of Thomas Newman’s oft-imitated spare, emotive scores for American Beauty and the like, but the lumpy pacing ends up giving short shrift to him and other modern composers like Danny Elfman and the late James Horner (relegated to a “Remembrance” over the credits). In between, there’s some attempt to explain the science of music from Moby, of all people, in Mr. Wizard mode, as well as some discussion of the nitty-gritty technical details of how a score actually makes its way from “spotting session” to recording studio—all of which hint at the multiple directions a documentary about film composing could have gone. But by attempting to cover it all in just over 90 minutes, Score ends up feeling slightly shallow, and its omissions even more glaring. As it’s almost uniformly about classic Hollywood orchestral scores, there’s no mention of foreign composers like Nino Rota, Eduard Artemyev, or Fumio Hayasaka; no discussion of the durable influence of Tangerine Dream, John Carpenter, or Goblin; nothing at all on the unique musical worlds of Blaxploitation or horror. There’s only a quickly glossed-over allusion to the fallow periods in the ’60s and ’80s when rock and pop compilations threatened to make film scoring obsolete, and a similar feint toward discussing the newer, more experimental modes being explored by the likes of Trent Reznor and Atticus Ross. Oddest of all for a doc ostensibly targeted at obsessives, there’s not even a hint toward film music’s intense fandom, a thriving culture that’s helped keep the form alive through decades of collecting and who would arguably be most interested in watching a movie about it—as evidenced by the fact that Schrader completed the film through crowd-sourcing campaigns. Where Score proves its value to those fans is when it simply allows them to watch these composers at work, enjoying the simple pleasures of seeing Holkenborg bang out the titanic drums for Mad Max: Fury Road on his MIDI keyboard, watching Dario Martinelli make a virtuosic run at the harpsichord or Mark Mothersbaugh tinkle away at a toy piano, talking about how he wrote the Rugrats theme. There are similar, vicarious thrills in watching Joe Kraemer inside the legendary Abbey Road, conducting an orchestra of talented musicians as they nail a sight-read of his Mission: Impossible—Rogue Nation score on first attempt, or Logan’s Marco Beltrami recording a piano as it decomposes out on a windswept hill. Those moments do far more to argue for the oft-overlooked artistry of film scoring than a dozen talky testimonials. It leaves you wishing Score had taken its own advice and just shut up and listened.